From Books I (partial), IV, and V of Caesar's Commentary on the Gallic Wars. This text can be read by students who have finished Familia Romana. 96 pp. Contains an index of names, and an index of vocabulary. Text and marginal notes in Latin. Index Vocabulorum, Index Nominum. In margine paginarum explanatur vocabula quae non reperiuntur in libris qui inscribuntur Lingua Latina per se Illustrata Pars I: Familia Romana et Pars II: Roma Aeterna. LXXX paginae. LATINE DOCEO, COMPANION FOR INSTRUCTORS. This title provides a running outline/commentary on the Latin grammar covered in Book 1 of Lingua Latina (Familia Romana), and includes the complete text of the Orberg ancillaries Grammatica Latina and Latin-English Vocabulary. It also replaces the student guide, Latine Disco. The book is designed especially for college students who approach Lingua Latina at an accelerated pace. The Exercitia may still be used as an additional source of exercises. 348pp, softcover, 7" x 10"
Selection from Petronius's Satyricon. To be read by students who are halfway through Roma Aeterna. Text and marginal notes in Latin. This text provides readings from Latin authors for students who have completed the first book in the Lingua Latina series, Familia Romana. As with all Lingua Latina materials, the text and notes are all in Latin. The previous booklet Plautus: Menaechmi is now included here (pp. 21-28). An illustrated series of 24 dialogues (colloquia). There is one colloquium matching each of Chapters 1 - 24 of Familia Romana. Notes in Latin. To fruitfully understand Thomism, one must have more than a basic knowledge of Latin, but a guide to assist in grasping the philosophical and theological syntaxes employed by the Church's Angelic Doctor and thereby receive the full meaning of a phrase in its particular context. 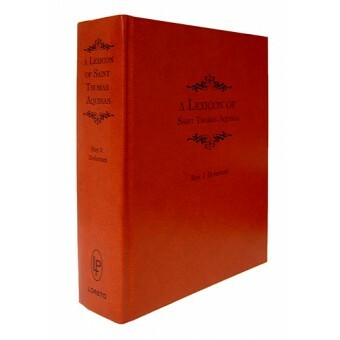 Dr. Deferrari's epoch work, Lexicon of St. Thomas Aquinas is that ready guide! Based on the greatest of the doctor communis' works, as outlined in the Foreword, each word as it appears in the Summa Theologica (et al) is followed by the different English meanings with which it is used, followed in turn by some illustrations of its use in each meaning taken from the works of St. Thomas.